Step 1 In a large soup pot, brown the meat and and saute the onions until cooked through (I cooked the meat & onions at the same time). Add in the tomatoes, sweet potatoes and stock, followed by all the spices. Let simmer until the sweet potatoes have cooked through, about 20-30 minutes. Step 2 Meanwhile, chop up and saute the bacon until crispy. Reserve until ready to serve. Then, fry or scramble one egg for each person you plan on serving. Step 3 Serve by scooping the chili in a bowl, top with the fried/scrambled egg, some crispy bacon & some avocado slices. 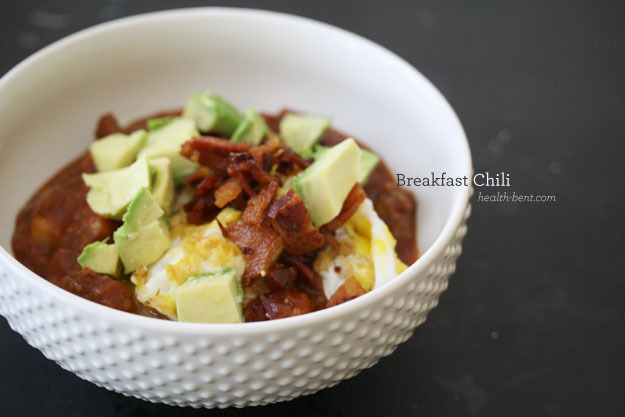 Adding bacon and eggs to a chili is a really great way to stretch a pound of ground meat. I originally set out to make this in the crock pot, as I’m trying to broaden my crockery cookery horizons, but then promptly realized that cooking this over an open flame would actually allow it to enter my mouth much sooner. Make this the night before, reheat & eat in the a.m. and breakfast (+ lunch) is done.